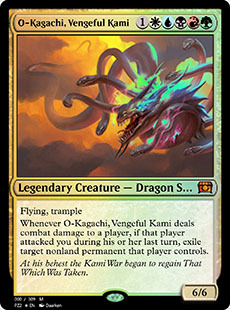 The Myojins are expensive legendary spirits that all have a shared mechanic: They enter the battlefield with divinity counters making them indestructible, and by removing said counter they have a powerful effect. A nice interaction to utilize these effects repeatedly can be done by playing Kindred Boon. This tribal enchantment will allow you to put divinity counters back on the Myojins for 1W, allowing repeated use of their big effects. This can help you to control a game particularly if you get the black Myojin out and start causing everyone to discard their hands. The second cycle I’ve included are the Star dragon spirits, each that has a beneficial effect upon their deaths. You’ll probably want to avoid putting divinity counters on them, but they are still big fliers that can put in a beating and do something when they die. Abzan Ascendancy and Field of Souls will both grant us 1/1 flying spirits each time one of our nontoken creatures dies, and those can be used in a number of ways. Fist of Suns will help us to cheapen 6+ casting cost creatures by making them only cost 5 mana. Herald’s Horn and Urza’s Incubator will also reduce casting costs for our spirits, and I’ve included a Trophy Mage to tutor out any one of those as needed. Kindred Summons will also slam spirits onto the board, however you’ll want to have a bit of a board state prior to casting it, and you don’t know if you’ll get expensive ones out but it’s still helpful. Lastly, if you happen to lose a bunch of the legendary spirits to a board wipe or it’s late game and your graveyard is full, Primevals’ Glorious Rebirth can get you back in the game in a jiffy! Outside of these highlighted cards, I’ve included a removal package, some ramp and other tribal goodies like Kindred Discovery and Vanquisher’s Banner. I’ve gotten pretty decent at putting together tribal decks, and though they’ll never be tier 1, they are still fun to play and can hold their own in casual circles. You can see the full decklist here. I have faced a few 5 color decks and tri + colors are being seen more and more often. It’s fascinating and very scary when they get some of those big cards out. I’m not comfortable to go down that road yet, but fun playing against and learning about. Really my edh articles don’t translate to standard so well, but you can at least get strategy ideas.